In the show, which debuts June 22, the crew of a U.S. Navy destroyer fights to save the planet after a pandemic has wiped out 80 percent of the population. 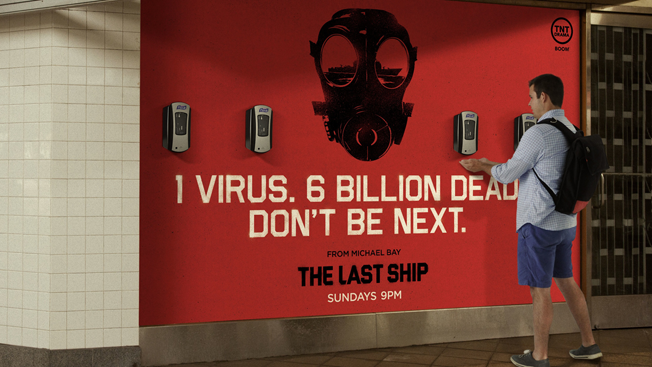 The campaign in New York City's historic railroad terminal features posters, banners and other elements with stark gas-mask imagery and messages like "1 virus. 6 billion dead. Don't be next," as well as hand-sanitzer dispensers from marketing partner Purell. I mean, why take that urban grit home to Greenwich? Grand Central commuters have probably developed an immunity to wacky ad stunts, owing to outbreaks of "Hammer Pants Dancers" for a certain MC's reality series (which, I'm sure we agree, changed the world in ways we're just beginning to understand), and "technophile living mannequins" for Sony. And who can forget the time a Dutch company rolled "the world's largest wheel of cheese" onto the platform? Gas masks might have come in handy after that fearsome fromage spent a day aging beside the tracks.